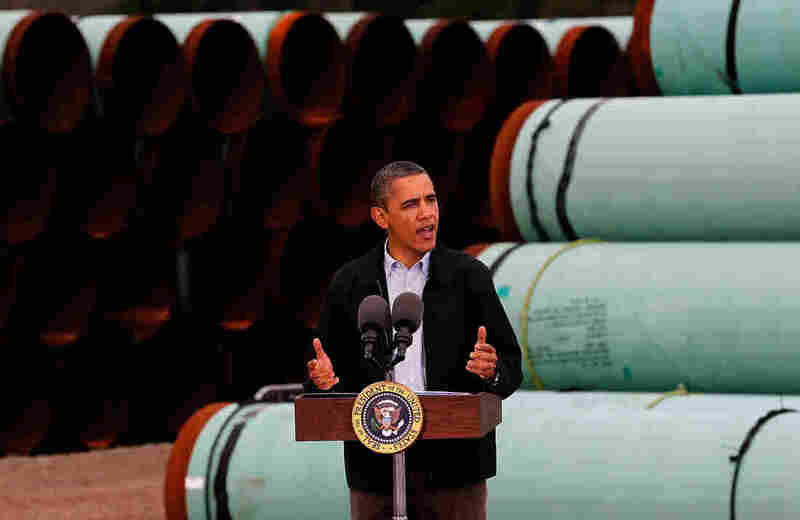 Weighing The Prospects Of The Keystone XL Pipeline Among the difficult decisions facing President Obama in his second term is whether to give the go-ahead for the controversial Keystone XL oil pipeline. Environmentalists want it blocked, while advocates of the project say it will create thousands of jobs and make the country more energy independent. President Obama speaks at the southern site of the Keystone XL pipeline in May in Cushing, Okla. Obama is under pressure to make a decision on the future of the pipeline during his second term. Among the difficult decisions facing President Obama is whether to give the go-ahead for the controversial Keystone XL oil pipeline, which would bring oil from Canada down to refineries in the Gulf of Mexico. Environmentalists want it blocked. They are concerned about endangering the Nebraska sand hills, under which is the largest aquifer in the country. It provides drinking water and irrigation water for several states. Oil companies and their supporters, meanwhile, say the pipeline is in the national interest because it will create thousands of jobs and make the country more energy independent. In January, Obama refused to make a decision about the fate of the pipeline, citing a State Department recommendation for more time to review alternative pipeline routes. But now that the presidential election is over, environmentalists and politicians are putting renewed pressure on Obama to make up his mind. Sarah Ladislaw from the Center for Strategic and International Studies spoke with NPR's Renee Montagne about the prospects for the project. "It's a really hard question to answer because there's a variety of perspectives involved. If you're an oil sands producer in Canada, then you obviously think it's fairly necessary to have this infrastructure to be able to get your product to market. If you're a refiner in the Gulf Coast of the United States, you probably think it's good to be able to get the right kind of crude into your refineries so you can sell it not only here but in global markets. If you're an environmentalist or someone who supports a transition to a lower carbon energy profile in the United States, you probably think it works contrary to what you think is actually in the ultimate best interest of the country." "The dangers they see are twofold: one, that it basically makes it possible for larger amounts of Canadian oil sands, which emits more CO2 and greenhouse gases into the atmosphere than conventional based energy sources. The second kind of environmental opposition they have is that it's a major pipeline that would be going through huge portions of the United States — some environmentally sensitive. But that larger question of whether or not it's sort of in our longer-term national interest to be perpetuating the production of this relatively abundant and relatively close-by oil resource, rather than promoting things like clean energy, is really sort of at the heart of the controversy." "In the United States we've now found that it's economically feasible and profitable to produce unconventional oil resources in a number of parts of the country in addition to unconventional gas. So what we've done, essentially, is flipped this scarcity mindset in North America that we don't have enough energy resources to one where we're actually quite abundant in these energy resources." "If you want to just track a barrel from when it's produced to when it actually makes it in your car per se, or into your heating fuel in your home, you have to go through a number of processes. One of those is being transported through a pipeline, and the other is being refined in a refinery. And oil is made into a whole host of products. A lot of the gasoline that's made from this oil could stay in the United States and a lot of diesel could be shipped to Europe. That's been sort of the pattern of how we produce and sell the products here. The other issue is that there's currently sort of an oversupply of oil within the midcontinent of the United States. And so a lot of what this pipeline does is it balances out that market a little bit. It allows some of the heavier crude, which is the oil sands, to come down to the Gulf Coast and a lot of the lighter crudes to go to the midcontinent. So whether or not an actual Canadian barrel that goes through the Keystone pipeline in its entirety is consumed in the United States — no, it won't be." "I do think that he'll approve the pipeline for two reasons: one, because he would have to find a reason why it's against the national interest. And for a country that doesn't have an overarching climate policy, that's hard to say because we believe in reducing emissions we don't necessarily want to be importing a higher-emission fuel. And the second being this has become sort of a political lightning rod to exemplify the debate between pro-oil-and-gas people and anti-oil-and-gas people in this country. And it's not the most effective way of debating those issues. So politically it would be good to get beyond it and get on to a lot of the other things that the president will have to debate within energy policy." Courtesy the Keystone Mapping Project. ©Thomas Bachand 2012. Thomas Bachand, who made this map of the proposed Keystone XL Pipeline, says that neither TransCanada nor the U.S. State Department would provide routing information. He pieced the map together from information obtained through FOIA requests and through cooperating state agencies. MP indicates states where milepost data are available. Mileposts are markers of longitude and latitude on the pipeline's route. NA indicates that this information is not available.